Gord and I saw The Book of Mormon tonight. 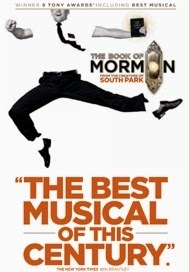 The Book of Mormon is a religious satire musical with book, lyrics, and music by Trey Parker, Robert Lopez, and Matt Stone. The Book of Mormon tells the story of two young Mormon missionaries sent to a remote village in northern Uganda, where a brutal warlord is threatening the local population. 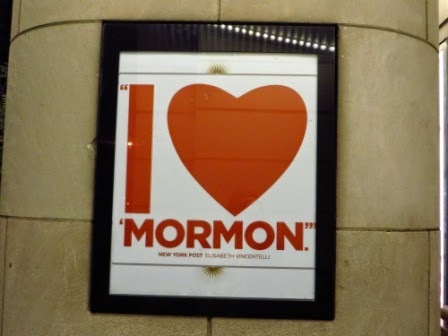 Naïve and optimistic, the two missionaries try to share the Book of Mormon, one of their scriptures - which only one of them has read - but have trouble connecting with the locals, who are more worried about war, famine, poverty, and AIDS than about religion. 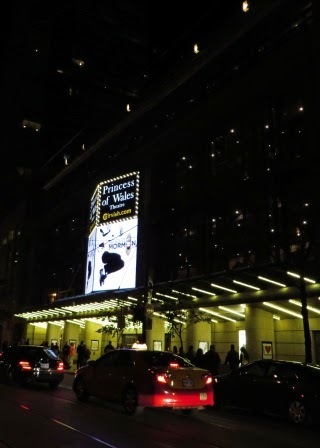 It is playing at the Princess of Wales Theatre and is the U.S. touring group. 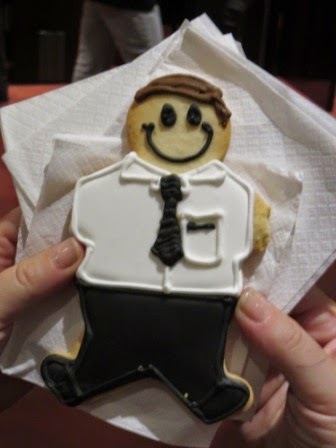 At intermission, a woman was eating a Mormon man cookie and let me take a picture of it (alas, she'd already eaten the arms ... one was holding a bible). It was a funny musical ... and sooooo not politically correct (plus there is swearing). Some of the running jokes were a Ugandan man who kept saying he had maggots in his scrotum, the Ugandans singing and saying "Hasa diga eebowai" often, and Elder Cunningham calling Nabulungi by a different name all the time (Neutrogena, Necrophilia, Nicki Minaj, etc.). Though everyone was excellent, Christopher John O'Neill stood out for me as Elder Cunningham. Our seats were in the second row in the balcony (so one level up) and at times it was hard to make out what they were saying (Gord and the woman sitting next to me said the same thing) so they might want to fix the sound. 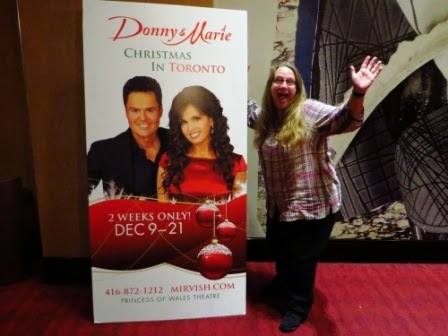 Sister Sarah is coming to visit in December and she and I are going to see Donny & Marie: Christmas in Toronto. Am I excited or what?! 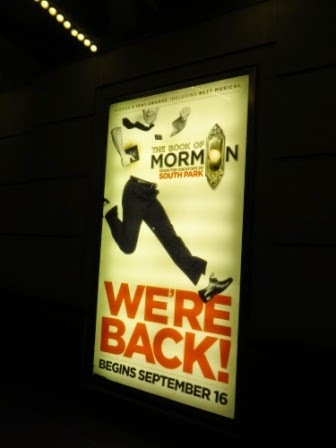 Chris and I have been wanting to see the Book Of Mormon, but we missed it when it was in Boston last spring. Still raking in 1.5 million a week in NYC - top seat there is $477.00!! !